Veep happens to be one of my favorite shows. Not just because it has a spectacular cast and excellent writing, but because they always seem to have smart promotional strategies. In fact, the team that launches their seasonal promotions have won awards for their cross-promotional strategies (who knew there were such award shows). 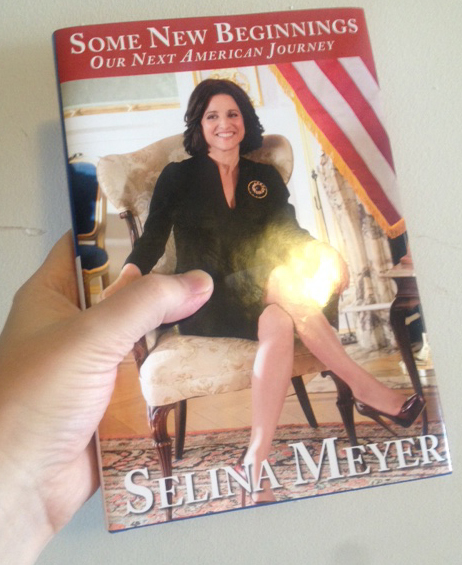 In season three, when Selina Meyer (played by Julia Louis-Dreyfus) was launching her presidential run, HBO literally started a presidential campaign to promote the show. They sent copies of Selina’s biography Some New Beginnings: Our Next American Journey to bloggers and critics to create buzz around those outlets (my blog didn’t exist during that time…which was why I didn’t receive a press pack…probably). This got other people besides HBO to talk and promote the show, commenting on the humor on the stunt: the books weren’t actually real, they were blank pages with the book jacket featured in the first episode. HBO claimed that it was a representation of who Selina is: shiny and glossy on the outside but empty on the inside (insert laughing emoji). They followed this up by doing a phone promotion where fans could call into Selina’s exclusive line and get a message from her Director of Communications, Mike McClintock (played by Matt Walsh). It was all prerecorded but it made fans feel apart of the show. A clever move. For this current season, HBO has followed a similar tact. Since Selina is running for reelection (spoiler alert), they allowed fans the opportunity to download free campaign posters. They then encouraged Selina supporters to tweet out or share pictures of the campaign posters in fans’ offices/yards/homes. Such stunts like these are clever because they bring a sense of reality to a fictional world. They make us feel apart of it, like we could essentially vote for Selina. This gets us talking about the show, which gets us excited about it and wanting to watch it. This is all the tip of the iceberg of everything HBO has done to promote Veep, but the originality and ingenuity behind the promotions is something I marvel at. It shows that they think outside the box, which is an application I personally espouse. So keep on keeping on, HBO. Selina may or may not win the presidency (I haven’t finished season 5 yet, please don’t spoil it for me), but in my book she’s won the best promotional campaign.